I hope your day, whether you’re spending it with your family, loved ones, friends, significant other, or just yourself and a six pack of beer, is wonderful! When Dave and I were dating, Valentine’s Day was never anything big for us. We’ve always kept it pretty low key, well, except for the fake Valentine’s Day when we got engaged. 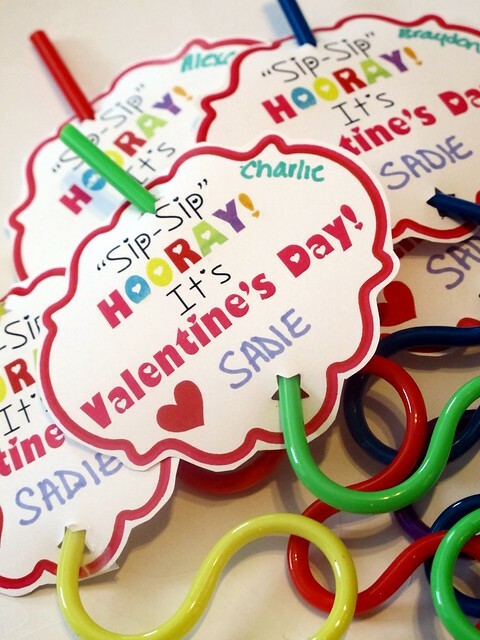 😉 But I LOVE celebrating holidays more and more with Sadie and Valentine’s Day is no exception! 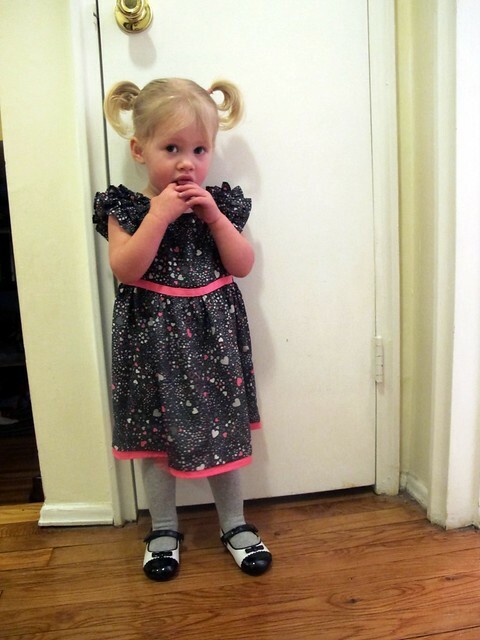 She’s off at daycare where they will have a party (we contributed Wheat Thins – it was on the list!) and then I have a bunch of goodies for her when she gets home (thank you Target!) WOOOOOO! Also Sadie’s dress? $8 at Target! 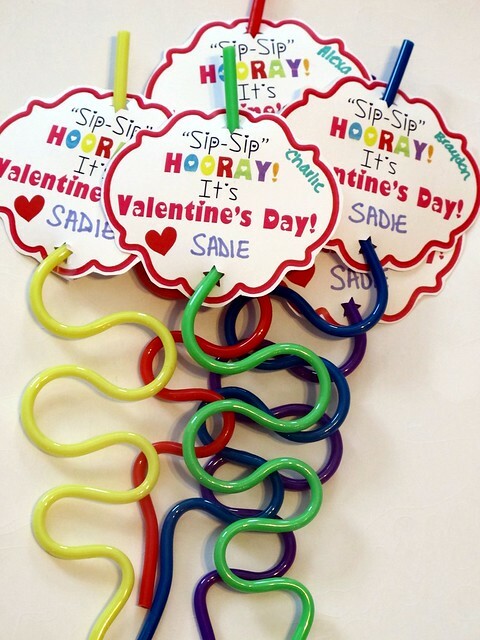 It took no time at all to cut out the cards, write the names on them (since Sadie you know, can’t write yet), punch the holes and insert the straws for her classmates. Easy peasy! Total cost: $3.00. TOTAL. Because I had everything else already and the straws were a dollar store find. WIN! And I didn’t want to give the kids candy or chocolate – they’re all like 1 1/2 to 2 years old! 1. M&Ms! I used four bags total – two plain and two peanut. 5. 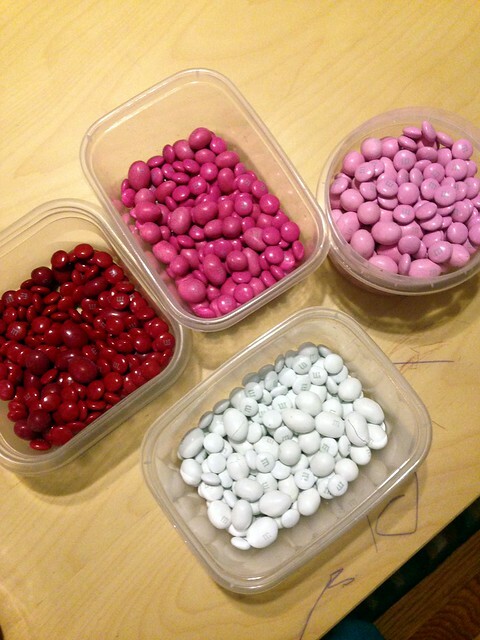 Containers to sort out M&M colors. Sit at a table with your husband (and stop him from eating ALL OF THE M&Ms) and sort out each color. 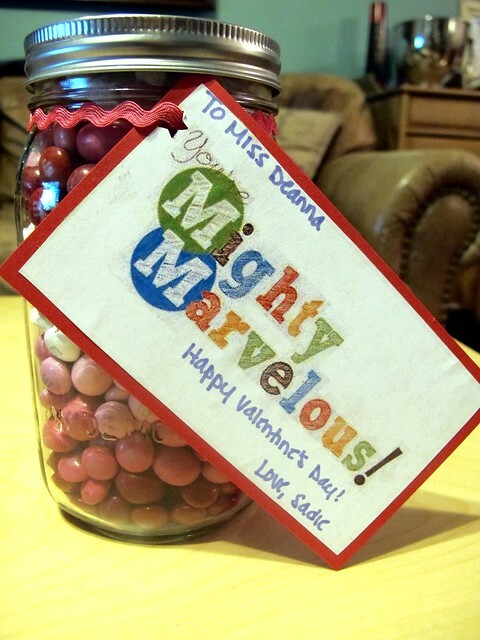 (PS – there is a serious LACK of the white M&Ms in these Valentine’s Day bags… wtf Mars?) Then layer into the jars. 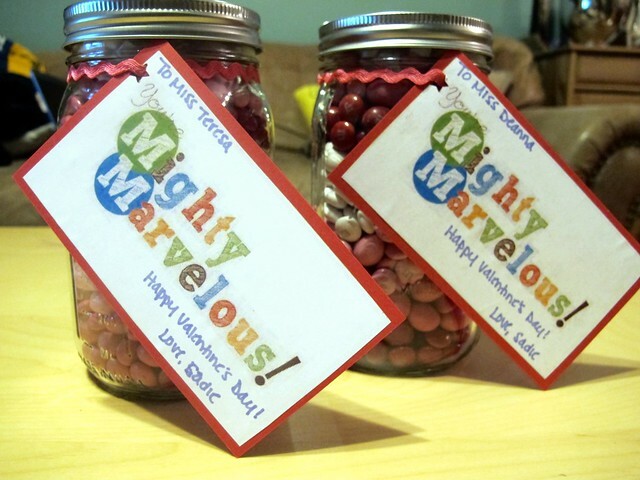 Add the M&M themed “Mighty Marvelous” gift tags with some snazzy ribbon (or in my case, bric a brac) and call it a day! I hope they like them! These gifts were a bit pricier mainly due to the M&Ms (even with a coupon!) and the mason jars. But now I have the jars in bulk, so I’m set! I’d say these were a little over $6 total, per jar. Not too shabby! Easy, cute, and budget-friendly. Hooray!! Affiliate links may be used – thank you! 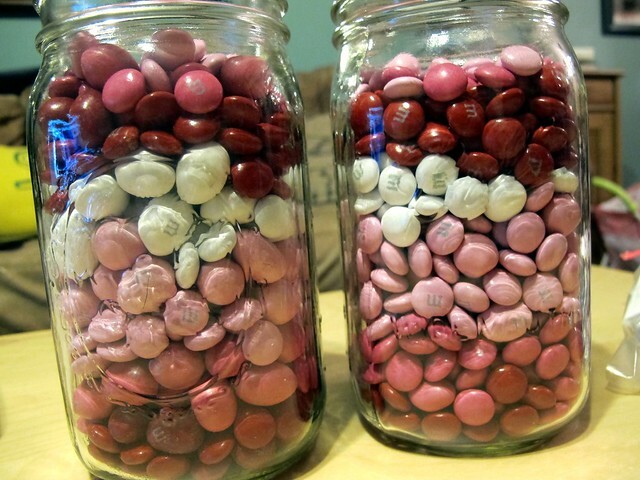 Your M&M jars turned out so cute! Thanks for sharing my printable. Oh my goodness, I love all of this. I always wonder how people get so crafty…makes it seem like even I could do this. 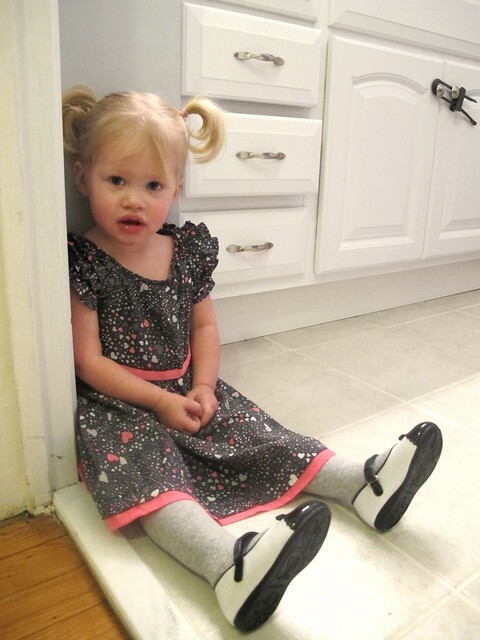 And Sadie’s dress is adorable, as is she! One. Sadie is just too freaking cute. Love that little dress. And two. Hurray for the crafts, they look great. I would love a jar of M&Ms please and thank you, ha. katelin recently posted…Tacos, Sunburns & a Whole Lot of Lovely. 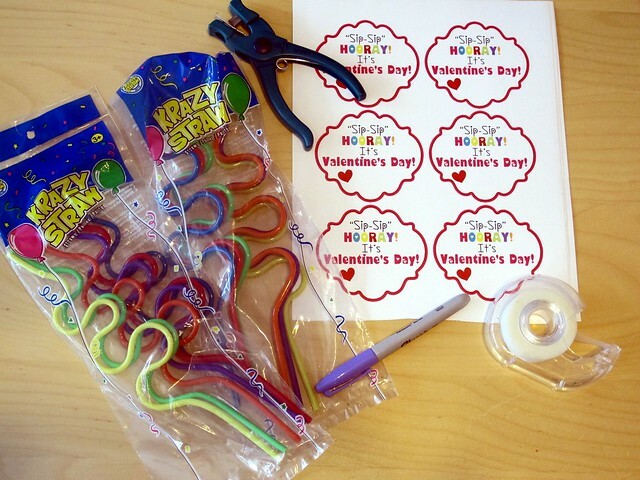 The straw valentine’s are absolutely adorable! Such a great find!